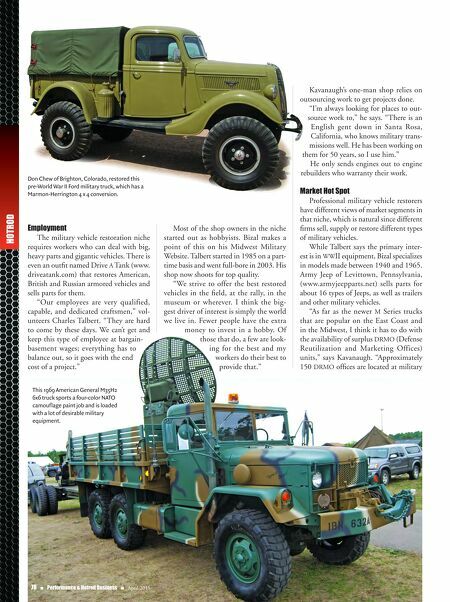 HOTROD Employment The military vehicle restoration niche requires workers who can deal with big, heavy parts and gigantic vehicles. There is even an outfit named Drive A Tank (www. driveatank.com) that restores American, British and Russian armored vehicles and sells parts for them. "Our employees are very qualified, capable, and dedicated craftsmen," vol- unteers Charles Talbert. "They are hard to come by these days. We can't get and keep this type of employee at bargain- basement wages; everything has to balance out, so it goes with the end cost of a project." Most of the shop owners in the niche started out as hobbyists. Bizal makes a point of this on his Midwest Military Website. Talbert started in 1985 on a part- time basis and went full-bore in 2003. His shop now shoots for top quality. "We strive to offer the best restored vehicles in the field, at the rally, in the museum or wherever. I think the big- gest driver of interest is simply the world we live in. Fewer people have the extra money to invest in a hobby. Of those that do, a few are look- ing for the best and my workers do their best to provide that." Kavanaugh's one-man shop relies on outsourcing work to get projects done. "I'm always looking for places to out- source work to," he says. "There is an English gent down in Santa Rosa, California, who knows military trans- missions well. He has been working on them for 50 years, so I use him." He only sends engines out to engine rebuilders who warranty their work. 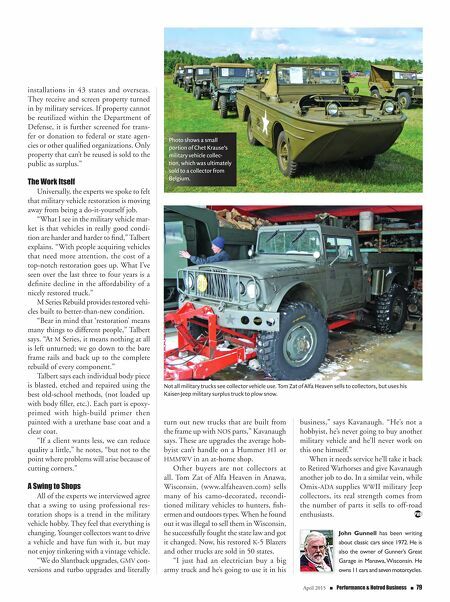 Market Hot Spot Professional military vehicle restorers have different views of market segments in that niche, which is natural since different firms sell, supply or restore different types of military vehicles. While Talbert says the primary inter- est is in WWII equipment, Bizal specializes in models made between 1940 and 1965. Army Jeep of Levittown, Pennsylvania, (www.armyjeepparts.net) sells parts for about 16 types of Jeeps, as well as trailers and other military vehicles. "As far as the newer M Series trucks that are popular on the East Coast and in the Midwest, I think it has to do with the availability of surplus DRMO (Defense Reutilization and Marketing Offices) units," says Kavanaugh. "Approximately 150 DRMO offices are located at military 78 n Performance & Hotrod Business n April 2015 This 1969 American General M35H2 6x6 truck sports a four-color NATO camouflage paint job and is loaded with a lot of desirable military equipment. Don Chew of Brighton, Colorado, restored this pre-World War II Ford military truck, which has a Marmon-Herrington 4 x 4 conversion.